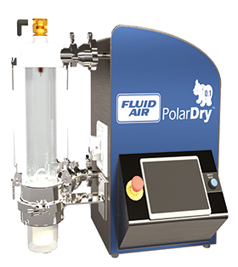 The Model 0.1 PolarDry electrostatic spray dryer has a design that follows current good manufacturing practices (cGMPs) enforced by the U.S. Food and Drug Administration (FDA). The dryer is compact, but can be easily disassembled for autoclave sterilization. The small dimensions allow the dryer to fit inside most lab fume or containment hoods to safely test systems containing toxic solvents, potent active pharmaceutical ingredients (APIs), and oxygen-sensitive materials. It is compatible with optional high-temperature and ultrasonic spray drying nozzles to improve overall microencapsulation; the ultrasonic nozzle is particularly suited for creating small particles of less than 10 μm. The dryer uses nitrogen as both the drying and atomizing gas (with flowrates up to 8.5 m3/hr and 3 m3/hr, respectively), so there is no need for atomizing heat, which reduces volatility losses. The dryer has a tabletop nominal evaporation rate of 0.1 kg/hr and operates between 20°C and 200°C. It features a 0.25-L collection volume, once-through gas handling, a feedstock pump, and a filter bag. The batch architect software controls are NEMA 4X-rated. The BOV series of vacuum ovens comes in a variety of sizes with more usable internal space than similarly sized ovens. The ovens are available with an internal volume of 0.9 ft3, 1.8 ft3, or 3.2 ft3, each with a temperature range from 10°C above ambient to 200°C and a maximum pressure up to 133 Pa. The interior chambers are made from Type 304 stainless steel with a mirror-polished finish for easy cleaning. Adjustable shelves can be added to accommodate containers of various sizes. The exhaust valve switch and pump switch are controlled by an electromagnetic valve controller to conserve vacuum pump power. The controller can be programmed with up to seven periods and a maximum of nine steps for each period, making for a total of up to 63 programmable steps with different pressure and temperature settings. A large viewing window allows users to observe their samples, and the color LCD screen depicts the measured vacuum data to help the operator monitor the progress of the drying sample in real time. These durable and efficient cartridge heaters are available in a variety of lengths and diameters. The heaters have a compact, swaged design for maximum heat transfer. They feature a Type 304 stainless steel sheath that is oxidation-resistant. Within each cartridge, a high-purity magnesium-oxide fill maximizes dielectric strength and thermal conductivity, and a nickel-chromium resistance wire is evenly wound for effective heat distribution. Each cartridge has a high-impact ceramic cap and high-temperature DuraFlex 550 lead wires, as well as a tungsten inert gas (TIG)-welded end disc. These heaters are suitable for applications that involve high operating temperatures or where heavy vibrations may be present. The P53-80-D18 compact ultrasonic sensor can be used in harsh environments, as well as in hygienic applications, for a variety of measurements. It can perform level measurements, detect the presence of objects, detect moving objects, count objects, and measure distance. It is 45 mm long and 18 mm in diameter, and the housing is made of smooth stainless steel with a roughness depth of 0.6 μm. It has a small profile and is easy to install and clean. The device has a sensing range of up to 800 mm and operates at temperatures up to 80°C. The industrial model includes an M12 connector with power supply and signal output, and can be mounted with two polytetrafluoroethene (PTFE) nuts that provide acoustic decoupling for stabilization. 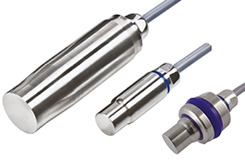 The sensor is European Hygienic Engineering and Design Group (EHEDG)-rated for Type EL, Class I applications. It is suited for use in environments with dust, moisture, or water vapor, and can be used for applications in manufacturing, food and chemical processing, and agriculture operations. The Qualiscan quality measuring system (QMS) contains Mahlo’s two new sensors, the Infrascope near-infrared (NIR) sensor and the Optoscope white light interference (WLI) sensor. The system can measure silicon coatings on fabrics, adhesive and polymer coatings on paper and film, as well as aqueous coatings, among other applications. It can incorporate 11 different sensors, including the Infrascope and the Optoscope. The Infrascope sensor monitors the absorption of infrared light of all components in the material web to differentiate between multiple components. The Optoscope sensor uses WLI to measure thin-film thicknesses in the nanometer range. Other measurement techniques, such as X-ray differential or laser triangulation-based measurement, are typically not exact enough for thin-film coating operations. The OXYvisor analyzer detects oxygen in flare gas, nitrogen headers, and hydrocarbons in the liquid and gas phases. The analyzer uses an optical luminescence technique that offers high accuracy, dependability, and low maintenance. It contains no membranes (which are susceptible to fouling) or electrolyte. It features advanced diagnostic, auto-calibration, and remote validation capabilities, so users can take action from a remote location based on the alarm condition of the analyzer. In the gas phase, the analyzer measures down to trace levels (0.5 ppmv) of oxygen, and in the liquid phase, it measures dissolved oxygen in the ppb and ppm ranges. It can be used in conjunction with the company’s BOSx Series, FiberSense, FlexSense, and SafeTap sensors. The analyzer has been tested and approved for direct use in Zone 2, Group IIC and Class I, Div. 2 Groups A, B, C, and D hazardous areas. It is International Electrotechnical Commission (IEC), National Electric Code (NEC), California Energy Commission (CEC), and ATEX-certified. Typical applications include: vapor recovery systems, annealing furnaces, enhanced oil recovery waterfloods, tank blanketing systems, and upstream to midstream natural gas processes. The Hydra-Cell Metering Solutions SM Series of electronic solenoid metering pumps is suitable for food and beverage processing, pulp and paper mill operations, pharmaceutical processing, and other specialized manufacturing and chemical processing applications. The pumps feature a simple hand-operated dial with stroke adjustment from 15 to 300 strokes per min. 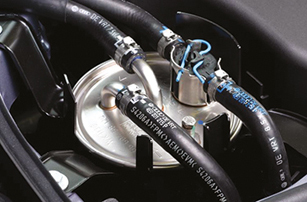 Maximum discharge volumes range from 28 to 100 mL/min and maximum discharge pressure ranges from 58 to 217 psi (4 to 15 bar), depending on the model. Each pump has a double-ball check valve to ensure accuracy and reduce the possibility of water hammer. An anti-siphon check valve prevents clogging at the injection point and aids in priming the pump. An optional integral relief valve automatically releases pressure if it exceeds the pump’s maximum capacity. A foot valve prevents backflow into chemical injection systems. All models are equipped with a protective secondary diaphragm. The pumps are dustproof and wash-down capable, and have an Ingress Protection (IP) 65 rating for indoor or outdoor use. The Portfolio, Process, and Operations (PPO) construction provides dimensional stability and high heat resistance. 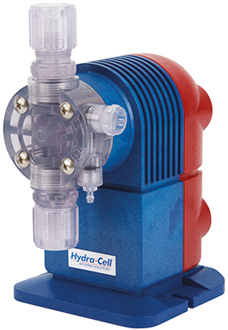 The pumps can be used with a 100–240-VAC power supply. Construction material options include polyvinyl chloride (PVC), polyvinylidene fluoride (PVDF), Type 316 stainless steel, and acrylic. The X-am 8000 multi-gas detector can simultaneously detect up to seven gases, including flammable gases, vapors, and oxygen. The detector’s compact, lightweight design allows it to be used with just one hand for portable use, or it can be easily converted to an area-monitoring device. Users can easily switch between pump and diffusion mode so that the pump only operates when it is needed, which reduces energy consumption and wear on the pump. Inductive charging makes the system more durable and less vulnerable to water, dust, and dirt, which may reduce maintenance needs and increase the lifespan of the device. It is suitable for applications in chemical, oil and gas, fire services, mining, shipping, pharmaceutical, and water treatment operations. 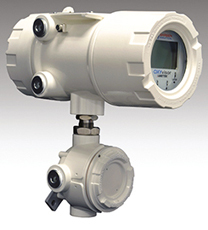 The ST100 Series thermal flowmeter supports vapor recovery systems in hydrocarbon storage tanks, which can help reduce greenhouse gas emissions. The meter is calibrated to measure the mixed hydrocarbon gases that are generated by tank loading and unloading operations. It provides direct mass flow measurement without any additional sensors or flow-calculating devices. It has no moving parts, which virtually eliminates wear, breakage, and maintenance. The basic insertion-style meter measures air or gas flows from 0.25 to 1,000 ft2/sec (0.07 to 305 m2/sec) with accuracy of 0.75%. Pressure ranges from 0 to 1,000 psig (0 to 70 barg) can be specified, depending on the model. Communication options include 4–20-mA analog, frequency/pulse, or certified digital bus communications such as HART, Foundation Fieldbus, Profibus PA, or Modbus RS485. An LCD screen continuously displays all process measurements and alarm status for easy viewing by technicians. The transmitter and electronics can be integrally mounted within the flowmeter’s housing or remote mounted up to 1,000 ft (305 m) away. The transmitter enclosure is NEMA 4X- and Ingress Protection (IP) 67-rated and available in painted aluminum or stainless steel. The meter is ATEX, IECEx, and FM approved. Savant SpeedVac vacuum concentrators use centrifugation, vacuum, and heat to remove solvents and concentrate samples. The line of products consists of eight vacuum concentrators that are compatible with a variety of solvents and come in several sizes. Model DNA130 is a compact, integrated system for low-volume sample preparation, including nucleic acids, polymerase chain reaction (PCR) preparations, and synthetic oligonucleotides, to support DNA and RNA applications. Model SPD120 is a modular system, resistant to aggressive solvents used in DNA and biological applications, such as methanol and acetonitrile with 0.1% trifluoroacetic acid (TFA). It is also suitable for applications involving freeze-drying or lyophilization. Model SPD130DLX is a modular system that is resistant to aggressive solvents used in combinatorial chemistry applications, including TFA and dimethyl sulfoxide (DMSO). Model SPD140DDA can be used for drying aggressive organic solvents, strong acids, bases, and combinatorial chemistry solvents. Models SDP1030 and SDP2030 are fully integrated systems, combining a concentrator, a refrigerated cold trap, a diaphragm pump, and a vacuum gage in a single, compact unit. Model SPD210 is a large modular system, suitable for drying aqueous and organic solvents at large sample volumes. Model SPD300DDA is a modular system, used for drying aggressive organic solvents, strong acids, bases, and combinatorial chemistry solvents at large sample volumes. The vacuum systems are suitable for pharmaceutical, biotechnology, academic research, industrial, agricultural, and food-testing applications. 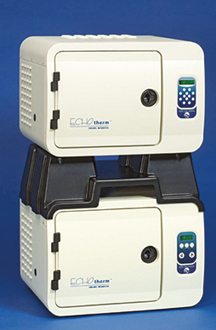 EchoTherm IN35 stackable, programmable incubators rely on the Peltier effect for convection-based heating and chilling. They do not require a compressor, do not contain chlorofluorocarbons (CFCs), and are vibration-free, making them suitable for protein crystallizations. Other applications include incubating marine samples below room temperature, enzyme reactions and deactivations, oocyte storage, and general lab incubations. Up to three units may be stacked using stacker accessories. The IN35 fully programmable unit can store three programs in its memory. 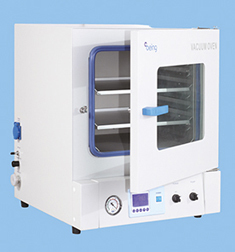 The incubator can be set at any temperature between 4.0°C and 70.0°C (controllable to 0.1°C), with an accuracy of 0.2°C. The temperature can be precisely ramped up or down. Each incubator has an RS232 I/O port for remote control and data collection, digital timer with user-settable auto-off, and audible alarm. They have a capacity of 27.5 L, measure 12 in. high, 10 in. deep, and 14 in. wide, and contain two stainless steel racks (with room for two more). The incubators are Compliance, Safety, Accountability (CSA), UL, and CE compliant. As a single-component system, EP3UF-1 epoxy is easy to handle, apply, and store. Due to its low viscosity of 5,000–15,000 cP, this heat-curable thixotropic compound is suitable for underfill applications. It has a high bond strength and dimensional stability, with a compressive strength of 18,000–20,000 psi and a tensile modulus of 450,000–500,000 psi. The material has a thermal conductivity of 9–10 Btu-in/ft2-hr-°F (1.30–1.44 W/m-K), making it an effective thermal interface material. It can be applied in bond lines as thin as 10–15 µm with a thermal resistance as low as 5 × 10–6 K-m2/W. The epoxy performs well as an electrical insulator and has a low dielectric constant of 4.5 at 60 Hz and a high dielectric strength of 450 V/mil (for a 1/8-in.-thick test specimen), both measured at 75°F. It can cure in 20–30 min at 250°F, or in 10–15 min at 300°F. Levapren PXL is an ethylene-vinyl acetate rubber-like polymer with a methylene backbone. It is available with a vinyl acetate content ranging from 50% to 80%. The fully saturated main chain is particularly stable, and degradation generally occurs only at very high temperatures, and even then, very slowly. It has a high viscosity, is easy to process, and can be used to manufacture high-quality hoses, cable sheathings, and floor coverings. The material is fabricated by reactive extrusion, which requires less peroxide than fabrication with radiation-induced precrosslinking. Extrusion also ensures that no trace of the crosslinker is left in the finished product. The polymer is a free-flowing granulate that does not adhere well to metal, which is beneficial when processing materials in mixers and on rolling mills. The material is hot-oil- and fuel-resistant, shows no outdoor weathering effects after two years of testing, and has fire-retardant properties. Tydrolyte is an electrolyte solution that can serve as a less-toxic drop-in replacement for sulfuric acid in automotive, motive, and stationary storage lead batteries. It incorporates sulfates to react with lead and lead dioxide plates during the discharging process. The electrolyte can extend battery life by reducing hold current, water loss, and corrosion, and can improve efficiency by reducing internal resistance. Lead battery manufacturers can switch to this electrolyte without additional capital expenditures or the need for new production technology.